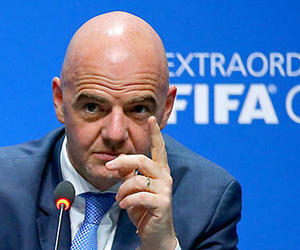 Gianni Infantino, president of the Federation Internationale de Football Association (FIFA by its French acronym), will make a brief visit to Cuba on Saturday, April 29th. Infantino will exchange with authorities of the Cuban Olympic Committee, the National Institute of Sports, Physical Education and Recreation (INDER by its Spanish acronym) and the Cuban Soccer Federation. He will also be present at La Polar Stadium, where it was recently placed the first and only artificial grass of Cuba. There he will briefly exchange with the press, shortly before leaving the Caribbean island.